This article provides a practical explanation of Benjamin Bloom’s taxonomy. After reading, you’ll understand the basics of this powerful effectiveness tool. 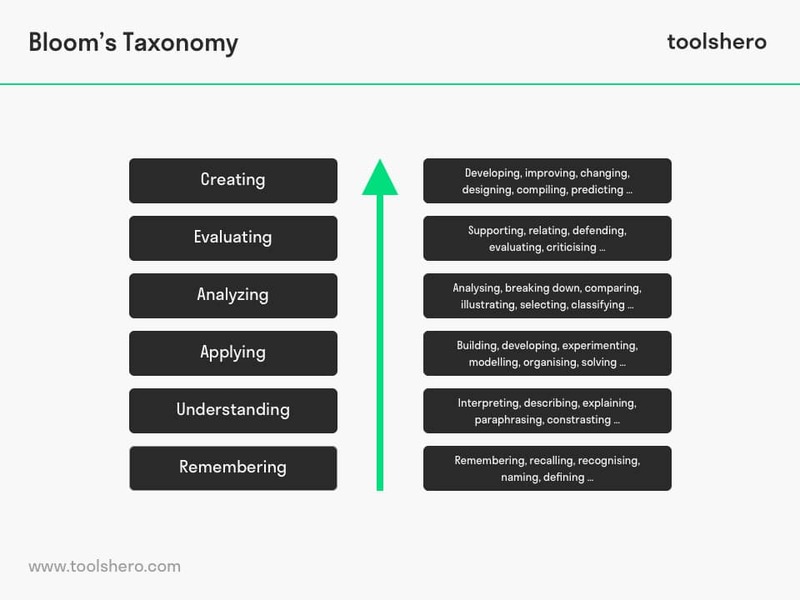 The taxonomy model presented by Benjamin Bloom, psychologist at the University of Chicago, is a classification of the various objectives that teachers or coaches may use to set goals for their students. Bloom’s Taxonomy expresses the cognitive learning process in a series of verbs and is used to stimulate more extensive forms of thinking, such as deeper analysis and evaluation of procedures, processes, principles, and concepts. This framework is especially effective in creating educational models. Bloom’s Taxonomy was first introduced in 1956. The first version included six levels of learning: knowledge, comprehension, application, analysis, synthesis, and evaluation. Each category included subcategories, all arranged from simple and abstract to complex and concrete. In 2000 and 2001, Bloom’s Taxonomy was revised by several of his colleagues. Former student Lorin Anderson and David Krathwohl, partners in defining and publishing the original taxonomy, published the revised ‘A Taxonomy for Teaching, Learning and Assessment’. Unlike Bloom, who labelled his subcategories using nouns, Anderson and Krathwohl defined them as verbs. These verbs, which can be used to set different learning objectives, describe the cognitive processes that intellectuals use to absorb and process knowledge. Each learning objective includes a verb, an action, and a noun that indicates what the student expects to absorb in terms of new knowledge. Conceptual knowledge in Bloom’s Taxonomy refers to the knowledge or understanding of concepts, models, principles, theories, classifications etc. Conceptual knowledge is also referred to as declarative knowledge and can be developed through reading, watching, listening, experiencing, or by practising contemplative mental activities. Conceptual knowledge is like a network of connected pieces who’s links, the signals that are transmitted, are just as important as the information pieces themselves. By definition, conceptual knowledge cannot be learned by heart, but must be practised by learning in a thoughtful and contemplative way. The know-how structure of conceptual knowledge differs from factual knowledge, which includes the individual information pieces. Factual knowledge consists of basic elements that, for example, students must know to get a complete overview of a discipline or to solve problems. It includes knowledge of terminology and specific facts. Procedural knowledge, also referred to as imperative knowledge, is a type of knowledge that is practised when performing a certain task. The aim is to learn how a certain action must be executed. The classic example here is learning how to cycle. No matter how often someone is explained how to cycle, the person will only get the hang of it after a number of tries. This type of knowledge is difficult to explain, and therefore difficult to communicate verbally. In simple terms, metacognitive knowledge involves thinking about one’s own thought process. Meta means ‘beyond’, and therefore goes one step further than the types of knowledge mentioned above. Bloom’s taxonomy is an effective tool for this. By actively thinking about how certain learning goals can be achieved, one’s awareness is improved. Below is a description of the six elements / levels from the cognitive dimensions based on Bloom’s Taxonomy. It represents a process of increasing cognitive complexity, from remembering factual knowledge to the development of, for example, conceptual knowledge. Each element is also associated with a number of verbs, the mental actions that allow one to set educative learning objectives. Remembering knowledge is all about collecting, remembering, and recognising certain knowledge. The Multi Store Model of Memory describes how memory works. Knowledge from the long-term memory includes facts, terms, answers or terminology. It is about recalling knowledge without creating any other link. Unfamiliar concepts can also be stored in this way. Understanding knowledge refers to the process of constructing meaning from oral, written or graphical pieces of information. This is done by interpreting, summarising, deriving, comparing, classifying or explaining the message. In the classroom, this can be practised by giving students a description or having them give a presentation about the subject in question. Application refers to the use of acquired knowledge, facts, techniques, regulations, etc. in order to solve problems. The acquired knowledge is used in a practical situation, where it is important that the learner is able to identify connections and relations between the pieces of knowledge and current situation. Analysis refers to the process of researching and subdividing information and identifying motives, relations, causes, consequences, and proofs in order to support generalisations. To avoid drawing incorrect conclusions, it is important to distinguish between facts and inferences. In Bloom’s Taxonomy, evaluation refers to presenting and defending opinions, ideas or materials by making judgements about the validity of information or the quality of a paper or researched based on a set of criteria. Evaluation can take place by analysing and processing criticism or feedback and making recommendations. Creating refers to the merging of elements to form a coherent or functional new whole. This may require reorganising a particular element and transforming it into something new through processes of generating, planning or producing. This component is the most difficult mental function from the revised Bloom’s taxonomy and requires a higher mental capacity. The information in Bloom’s Taxonomy can be applied in order to set effective and clear educational learning objectives. Students may do this for themselves, but the teacher, professor, or trainer may also develop these to actively guide students and have them practice the curriculum. A good and realistic learning objective contains one of the verbs from the six elements of the cognitive dimension and a noun. This noun indicates the exact learning, development or training intention. Keep in mind, the elements from Bloom’s taxonomy are arranged by difficulty. It is therefore important that all previous elements have been addressed first. Before a concept can be understood, the student must first remember it. To subsequently apply it, he/she must first comprehend it. To evaluate a process, it must first be analysed, and in order to draw a conclusion or create something new, the concept must first be evaluated. Below are a number of examples that have been created using Bloom’s taxonomy. At the start of the next lesson, the student is able to mention five personality characteristics from the Big Five theory. At the end of this week’s lessons, the student is able to explain the Karl Marx theory in his/her own words. At the end of this lesson, the student is able to independently calculate a Return On Investment based on the available financial reports. At the end of this semester, the student is able to distinguish between profitability ratios and solvency ratios. 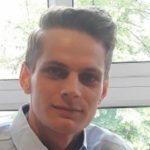 At the end of this lesson, the student is able to justify the strategic choice that a company must take on the basis of a cost-benefit analysis. At the end of this week, the student is able to design a lesson, including homework, for fellow students on the subject of Beyond Budgeting. What do you think? Are you familiar with the explanation of Bloom’s Taxonomy? Do you have any ideas on how to use this effectiveness tool in practice? What do you feel are factors that contribute to creating effective learning objectives? Do you have any additions or tips? Bloom, T. M. E. (1965). Bloom’s taxonomy of educational objectives. Longman.